Meditation is a great habit that will help you stay focused and calm during your day-to-day life. Here are 10 meditation techniques for beginners that will definitely help you! All of us lead busy lives today. There is so much noise all around us. And even when we try to get away from everything, there is so much noise in our head. We all have clutter that we have to clear. Meditation is a great way to help with us. Meditation is a technique that helps the human mind to remain centered and calm while rushing through our fast-moving lives. It reminds us of who we are. Meditation helps us train our minds and contributes to out mental health and fitness. Exactly like how exercise helps with physical fitness. Although the importance of meditation is coming more into the light now, this is actually one of the oldest concepts in the world. A lot of the Asian religions believe that meditating would bring people closer to god. This trickled down to the core Asian culture. There are many forms of meditation that exist today. And all of them can be traced back to the traditions followed by religions in olden times. As mentioned, meditation was considered to the pathway to a spiritual life. Meditation is most closely linked to Buddhism. The story is Buddha goes that he found enlightenment through meditation. The origin of this can be traced back to Southeast Asia 2600 years ago. By adopting meditation and mindfulness, Buddha was able to find his way to everlasting peace. In his teachings, Buddha explains that through meditation, awakening, and enlightenment must be practiced as a part of our everyday lifestyle. Along with this, some of the other teachings of Buddhism include proper ethical conduct and the wisdom of seeing things as they truly are. Many people have tried to use the wisdom shared by Buddha and practice meditation. Many scholars from our history have crossed the sea and traveled around the globe to learn meditation in depth. The eastern culture learned about meditation and began adopting it around the 19th century. And in the 20th century, the concept of meditation was popularized in western countries. Even today, there are people who would travel across the world to learn how to meditate and find peace of mind. With changing times and as more and more people began to show interest in and learn meditation, several unique techniques of meditation emerged. Meditation has proven to have positive effects on both our physical and mental health. Practicing meditation every day has helped people in many ways. In this article, we will go through ten techniques of meditation that we can adopt. Each of these techniques is unique. Just as each of us is unique as individuals. Because of this, not all of us may be seeking to learn about meditation or seeking to adopt meditation for the same reasons. Thus, it is up to us to choose the one that works best for us and suits our lifestyle. As a beginner seeking to learn about meditation, a lot of it may seem challenging and the idea of sitting of sitting in one place may seem impossible. Sit back and read through the techniques of meditation shared below. You will definitely find one that works best for you. This is a simple and straightforward meditation technique. To follow this method, sit back comfortably, take a breath and slowly close your eyes. Breathe in and out naturally through your nose. Focus on your breath and pay attention to the rise and fall of your abdomen. Place a hand on your stomach if needed. Do not try to take control of the breath. Let it be natural. This is a method that can be done anywhere; especially if you are short on time. It will help you gather yourself and refocus on the task at hand. For this technique of meditation, you will have to find a quiet space or corner. This is because, as the name suggests, during this meditation you will be sitting quietly while repeating the same word over and over again to yourself. This word will be your ‘mantra’. You will have to say this out loud and chant the word. One of the traditional mantras is “so, hum”. People who practice meditation as part of yoga say the mantra “Om” which is a sacred mantra in the Hindu and Tibetan prayers and texts. While saying the word, make sure to breathe in and breathe out slowly while taking in your surroundings. Your mind will wander in the beginning days. Do not worry and be persistent. For those people who absolutely cannot sit still, movement meditation is a good option. This works well especially for those who are dealing with anxiety issues. During this relaxation technique, we focus on our attention and our intention. During this meditation, it is best to walk outside. Be conscious of every step you take and listen to the sounds around you. Feel the sensation of your feet touching the ground and the weather on your skin. Do not listen to anything else but the natural sounds around you. If you have distracting thoughts, bring the focus back to your steps. This is a healing meditation technique that has originated from a long-standing yoga tradition known as the Kundalini Yoga. All Yoga poses and techniques are based on the science of how our body works. In this meditation exercise, you will have to say the sound “sa, ta, na, ma” to yourself while touching your fingers together. For instance, the flow would go like this – On sa, you would touch your index finger with your thumb; on ta, middle fingers to your thumb and so on. This technique is used to increase blood flow and improved sleep. Studies have also shown this meditation to help improve and even retrieve memories. It has been proven highly useful for individuals with Alzheimer’s. Sometimes, because of the way our mind works, some of us may find it much harder than others to find stillness in our life. When we sit down to meditate, it may not just be the random disturbances from our thoughts that act as a hindrance. We may be faced with a wave of emotions such as impatience, frustration, boredom, tiredness etc. This is not uncommon. For people who face this issue, the binaural beats meditation is a perfect choice. This is essentially a relaxation technique where technology has been used to induce the same brainwave state when someone is during traditional meditation. These are easily accessible online and can be downloaded onto your phone. Being mindful and aware of ourselves and our surroundings is meditation in itself. One of the best meditation techniques that can be done anywhere, is quick and shows the great result is the body scan meditation. It is one of the ‘foundations of mindfulness’ as per the Buddhist teachings. This technique helps you relax your body, heighten your sensations and help you to regulate your emotions. In the mindful body scan meditation method, you will have to find a place to sit comfortably and close your eyes for a few minutes. Once you are comfortable and sat down, slowly breathe in and out while focussing on the sensations on your body. Feel the warmth on your skin, concentrate on the moisture, focus in on any heaviness or pain and slowly let it go. Feel the ground below your feet, move your attention to your toes and try to concentrate on the flow of blood in your body. Follow the blood from your legs to your waist, your hands and to your head. The body scanning meditation technique is one of the best ways in which you can actively attempt to listen to what your body is telling you and pay attention to everything that is happening in your body. The Chakra is the center of energy in our body. This is acknowledged in yoga practices. 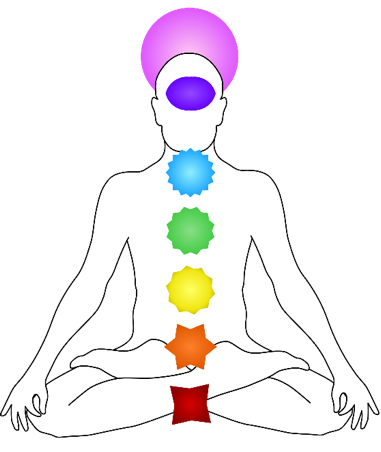 The Chakras in the human body were first mentioned in the ancient Hindu Vedas. Although there are different variations of chakra meditations available, all of them follow the same concept of focussing on the energy centers in your body while breathing in and out. There are totally seven chakra points in our body – Root (base of the spine), Sacral (few inches above belly button), Solar Plexus (upper abdomen), heart, throat, third-eye (between eyebrows) and crown (top of the head). This is a meditation technique that is derived from the religion and philosophy of Taoism. Taoism is a religion that primarily focuses on living in harmony with oneself and everything around us. Within the Taoism philosophy itself, there are different variations of meditation techniques. All of them have to do with visualizing, contemplating and mindfully being aware of ourselves and our environment. The Taoist meditation techniques are similar to that of the Buddhist techniques of meditation. Be sure to read the types of Taoist meditations – Alchemical mediation and inner smile mediation to fund out more about this technique. Osha, a renowned controversial personality came up with a set of modern meditation techniques that people could adapt. He believed in philosophies that were derived from different parts of the world. One of his strong beliefs was that the modern human being was not ready to begin adapting the traditional meditations techniques and so he developed dynamic meditations that he thought would suit us best. In this technique, you have to breathe in a chaotic manner in and out of your nose. Do this for 10 minutes or until you are short of breath. After this; yell, scream, shake and do whatever you have to do to release the pent up energy in your body. After ten minutes, jump up and down and repeat the mantra “Hoo! Hoo!” to yourself. Feel in energy on your feet and the ground below you. And finally, freeze and take in the sensations around you and the sensations in your body. Do this for 15 minutes. Guided meditation is a form of online meditation that can be found by anyone who has searched meditation techniques using Google. It is easy to adapt beginner meditation technique where individuals use an online website or mobile application that guides them through their meditation. This technique is best suited for those who have not been able to find a suitable teacher to learn meditation from but are still seeking to use learn meditation to get away from the noise and chaos of the world. Many mobile applications offering this service have gained immense popularity. When choosing to meditate pick a space there is the most comfortable for you. Ideally, this should be an open space with fresh air. This could be at a part or if you prefer silence, then your balcony or terrace. Morning is the best time to meditate. It will be a great way to start your day with refreshed thoughts. Meditation will be hard in the beginning. But make sure to never give up. Be patient, kind and persistent. You will get there. A way to make meditation easier is to integrate mindfulness in everything you go through the day and not just during meditation. Mindful eating, walking, and reading is some of the most common things you can do.